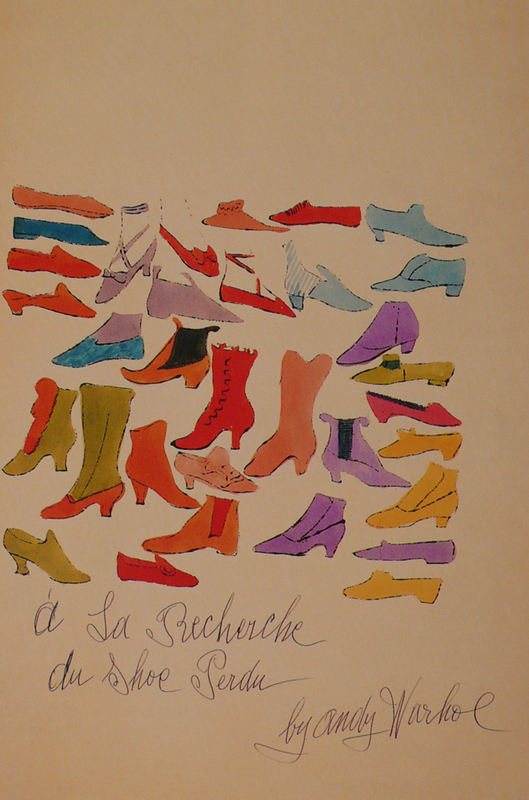 À la recherche du shoe perdu, Andy Warhol, 1955. Blotted line drawing, watercolor and ink on paper. The title is a play on words inspired by Marcel Proust’s novel À la recherche du temps perdu. Ralph Pomeroy (1926-1999) throughout his writing career published essays, monographs, catalogs, three poetry collections and an illustrated book of poems with Andy Warhol entitled “A La Recherche du Shoe Perdu“. One of his books was about painter Theodoros Stamos. His friend, Edward Field, discusses his life in his book: The Man Who Would Marry Susan Sontag and Other Intimate Portraits of the Bohemian Era (2007, University of Wisconsin Press) In an article for the “The Gay & Lesbian Review,” (July–August, 2005, Volume 11 Issue 4), Field notes that the openly gay Pomeroy was accepted by Yaddo 1955, “where he scandalized the sedate arts colony by having an open affair with painter Clifford Wright.